Over the past seven days I’ve introduced you to seven names that make up the seven skin tones of my doll wool. 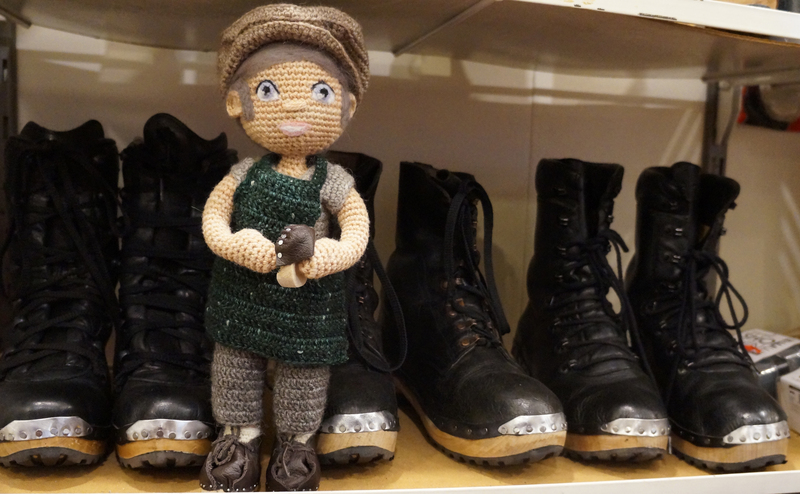 Last year I was obsessively making dolls for my final university project, these Northern Folk dolls were a challenge to me, a doll maker, in whether I could produce a doll that was locally sourced, naturally made and inspired by local folk. The main part of the dolls was the yarn that I used to crochet them with, at the time I used an acrylic wool. This is pretty much what 99.9% of knitted and crochet dolls are made up of. The only skin tones I could find was a few browns and the only lighter skin tone was Sirdar Hayfield which is a budget acrylic yarn. 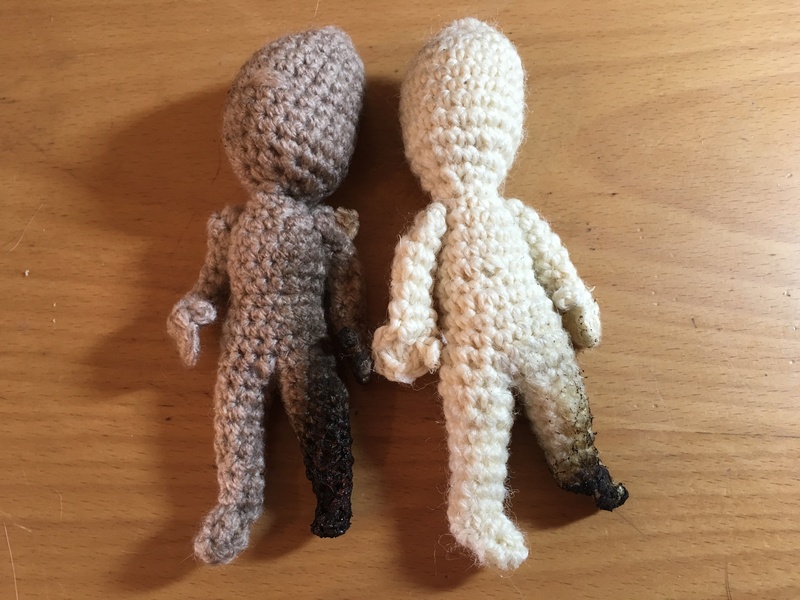 Over the last few years, and with the introduction of amigurumi, crochet doll making has increased in popularity and yet the shades of yarn remained the same. I think one of the problems was yarn manufacturers thinking only in terms of clothing and in reality, who wants a flesh coloured jumper? Another problem was the use of acrylic, I’m not a yarn snob, not at all, but we’re in a situation where we need to take a serious look at plastic and it’s effect on the world. It seems crazy that the Media seem obsessed with our use of plastic straws and yet celebrate Christmas jumper day, a day when we all buy a new acrylic ugly jumper which we’ll wear only a handful of times before discarding. So, It had to be done, I had to make a wool yarn in skin tones, just for my final university project, and I admit, at the time I had the intention of continuing to use acrylic after university because, well, not only am I not a yarn snob, but I am very much against yarn snobbery. After months of testing dyes and wools and turning my kitchen into a dyers studio I found seven tones that I liked. I chose the Cheviot sheep as a breed for the wool, being a Northern sheep breed, I might not be a yarn snob, but I’m certainly passionate about Northern quality. I found a family run mill helping me keep big fat-cat companies as far away from the project as possible, and a local small dye company with a similar family feel. I can’t trace my wool back to the sheep, but pretty close. The farmers take the wool to Bradford, it’s spun in Huddersfield and using dyes from Sheffield I create the wool in Leeds. Even the pipe cleaners I used for the armatures came from a small factory in Huddersfield. It seems a shame to keep such a great wool all to myself, so after university was over, and I spent some time sorting out my health (for those who don’t know, I’ve done all this whilst being quite ill – No they still don’t know what’s wrong, but the last time I saw the Cardiologist they were thinking about heart failure, but don’t worry, I’m on the up!) I decided to manufacture the wool. As many knitters will know, yarn comes in colours and each colour had a name. So, I spent a long time trying to work out what to name the tones (I call them tones rather than colours because they are skin tones and it keeps us thinking we’re all equal in tones rather than separate as colours). I saw tones named after food (strawberry, chocolate, honey) and tones named after drinks (Latte, Coffee) but it didn’t seem right, in fact it felt wrong. The above tone chart comes from Windsor and Newtons felt tip range… Putty! Who on Earth wants to describe themselves as Putty? Isn’t putty that off-white stuff you use on windows? Then there was my personal feelings about dolls and doll making. There was so much research about the effects of dolls on children and I decided the whole doll making process had to be one of inspiration. I can’t remember the day it happened, but after weeks and weeks of searching for tone names and looking at images of people from across the world. I decided on using names of people for skin tones. Each person had to be a woman of that skin tone who could be an inspiration to doll makers, doll collectors and most importantly players of dolls. It was important that when a child held a doll of a darker skin tone, they knew that there was no limits to who they could be in life. People like Mae Jemison, who had dreams of going into space as a child, tell the young children of today that their dreams can become reality, that no one has the right to quash the dreams of the young. No one can stop a plus sized young girl like Shelby from being an athlete. Sports companies might not make plus sized athletic wear, thinner people might try their best to body shame larger children into dieting, but size doesn’t matter in our dreams and Shelby, with her Princess attitude proves just that. Coming from wealth or coming from poverty, having two parents or none, having the best paid education, attending funded courses or learning later in life makes no difference in getting where you want to be in life. I have the privilege of being a doll maker, it’s a magical job where I have the power to inspire the next generation simply by making the dolls that will inspire their dreams. The seven shades will be available on my Etsy shop and on the shop on this website. The wool comes in 100g skeins, plenty enough for one of my Crochet dolls which are 15″ tall. It’s a thicker side of DK weight yarn but works with 3mm-4mm needles to create a tighter fabric to help avoid stuffing showing through, this is vital for those who make dolls to sell since it’s a requirement of the EU safety laws. So far only two tones (Shelby and Malala) have been tested to EN71 safety, making it safe for doll and toy making. and it passes the doll flammability tests. It’s going to cost a couple hundred pounds to have all the wools tested so I want to see if it’s popular before spending so much money on testing. 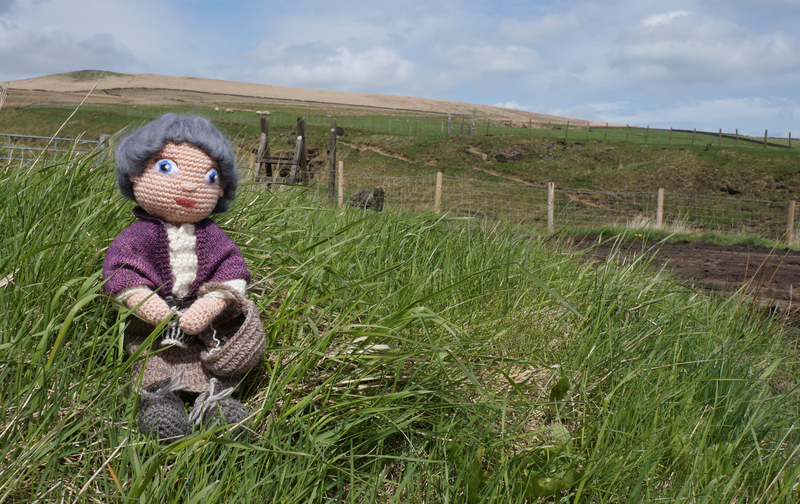 It’s the only wool of its kind in the world (I searched high and low but perhaps there’s another wool out there) which is made especially for doll making, produced fully in the UK (and apart from the sheep themselves) is produced in Yorkshire. It’s currently priced at £18/100g although I will do an introductory price and wool shade cards for retail and large orders will be available very soon. Our fourth Yarn tone is named Malala after Malala Yousafzai. Malala is known to most people as the fifteen year old Pakistani schoolgirl who was shot in the face for wanting an education. Surviving being shot in the face didn’t deter Malala from speaking out for girls education which just shows the determination of Malala and her family. Perhaps not so well known is that Malala’s activism for girls education didn’t start on that bus ride home at 15, but started much earlier as an anonymous 11 year old blogger for the BBC Urdu website. Her father was an educator and encouraged Malala to get her education because he remembered growing up in a world where his sisters unable to be educated. He wanted more for his daughter and put her name forward to write the anonymous blog which would describe life under Taliban rule. Malala wrote anonymously until the end it seemed freedom had come and girls were allowed to attend school again. After the Taliban returned her family were split up and Malala ended up living with relatives, then the New York Times made a documentary about Malala and as she became more known her anonymity began to end. With the news that again the Taliban had been forced out of their home the family returned, but now the death threats arrived. Both Malala and her father received death threats for their support of women’s education. The eventual shooting happened as Malala travelled home from taking an exam. A gunman got on the bus and asked Malala to identify herself otherwise all the girls would be shot. She was then identified and shot in the face. I don’t think there is need to say more about why Malala is an inspiration, although there is a lot more that can be said. To be as young as eleven and knowingly put your life on the line to make the world better for yourself and others is courage beyond measure. Shelby is the name of our third yarn tone and is named after Shelby Sinar. Shelby is a women’s wrestler for UK Womens Wrestling, perhaps not the most popular of sports and Shelby might never be a household name or olympic medal winner. However, it takes real courage to get into a ring and use quick thinking and athletic skill to win matches. To do all that whilst being in a created personna too, which I think is a skill that’s not given enough credit for. But what makes Shelby inspirational for me is her courage to do this while being a larger woman than the stereotypical athlete. Shelby fights under her characters name of the Plus-Sized Princess. As a plus sized woman I’ve experienced the bullying, the comments from strangers who feel it’s acceptable to comment on my size or perceived lifestyle. The fear that someone is just waiting to put me down, even as I write this blog post I’m aware that someone most likely is going to make a comment about larger people because it’s a bullies last stand. To be a larger woman and put yourself out in public is one of societies last taboos, but let’s be honest, I don’t know too many thinner women who can throw a full sized person around like Shelby does which just proves size isn’t everything. To be a female wrestler is a tough enough sport, but to do it with the courage of Shelby Sinar, to be the powerful woman she chooses to be, is why she is an inspirational woman. Our second Tone colour is named Emma after Emma Watson. Most recognisable as Hermione Granger in the Harry Potter films who had the brains, skills and looks to be the best at what she put her mind (and spells) to. Emma Watson is in many ways the girl who has everything, the looks, the talent and the brains. Attending prestigious private schools, Landing her first professional acting role as Hermione, getting a professional career and attending universities in both the US and UK, then gaining a successful modeling career with campaigns for companies like Burberry and Lancôme. I think, when most people think about inspirational women we don’t often think of people like Emma. We imagine people who have overcome hardship, who’ve had to fight for their dreams, who didn’t have it all. Here’s why I chose Emma as one of the seven inspirational women. Emma could have taken the privilege of her life and bought herself a nice mansion, done her films and modeling and said thank you very much and no one would have complained. Many celebrities do just that and we celebrate them and award them for it. Emma though has spent much of her time speaking out for women and girls who were not as privileged. She is an active goodwill ambassador and a speaker for gender rights. She speaks on feminism not as a women’s movement, but as a fight for equality that affects men as much as it affects women. Her determination to raise awareness on equality for everyone os why she is an inspiration and named after one of our skin tones. Being an inspiration isn’t reserved for the overcomers, it’s important to recognise that everyone has the ability to reach out to others.